…and I’m okay with this. It’s not that the fairy stories hold no appeal. Confession time: In the months after my baby boy died, sometimes I indulged in daydreams about that kind of thing. My daydreams were always kind of sweet and funny. Mostly they involved my dear friends Colin and Dog, who died many years ago, one of AIDS and the other of suicide. In my mind they were all in the conventional heaven, and the two of them were playing with my son Jude, talking about him and laughing about the idea of me — the me they knew two decades ago, shaved head and leather jacket and Doc Martens and all — having a baby. But since neither of the two of them knew anything about infant care, eventually in my fantasy they would hand Jude over to my grandmother to raise. She’d take great care of my little guy, read to him and cook him big country breakfasts and send him off to school…wait, there are schools in heaven? Are they public, private or charter? Are the teachers unionized? This is where my afterlife fantasy fell apart. When I think about heaven too long it always falls apart. For me, questions about an afterlife always always end up leading to its absurdity. And if I tried to believe, the cognitive dissonance would drive me nuts. I can imagine a person who could shut down the questioning brain for the sake of comfort, but I can’t imagine a me who could. I couldn’t live like that. Literally, as in, I am not capable of it. I hate that I will never see my son again. But somehow, I can live with it. I do the same btw – and the fantasy also falls apart. 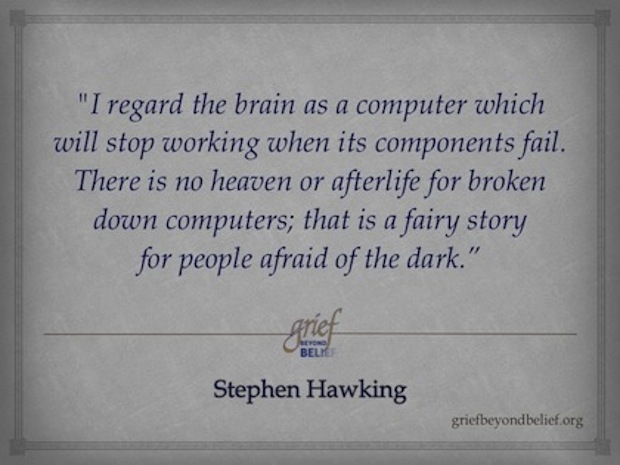 One of the most difficult parts of participating in mainstream grief support was dealing with people who had really literal beliefs about that kind of heaven. There was a lady who tried to comfort me by saying that her adult daughter who had died had loved babies. And she was sure her daughter was cuddling my son in heaven until I got there. Sometimes I think I am too skeptical for my own good. But it is just too damn hard to take those ideas seriously. I know she was well-intentioned, but it just left me shaking my head.